From your projects dashboard, click Reports button and locate the WHS Report tile under All or Risk Management tab. Click View Report. From your navigation bar, go to Management > Reports > WHS Report. 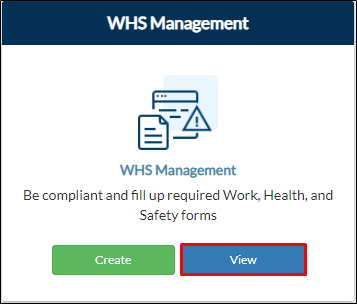 Or type in 'WHS Report' from the search bar located on the upper right corner of your portal. 2. WHS Report will be displayed. 3. Click Delete to remove your submission. 4. Click OK to confirm.